Buffalo, New York – Reichert Technologies® is pleased to introduce the all-new Phoroptor VRx Virtual Live Demo Experience. 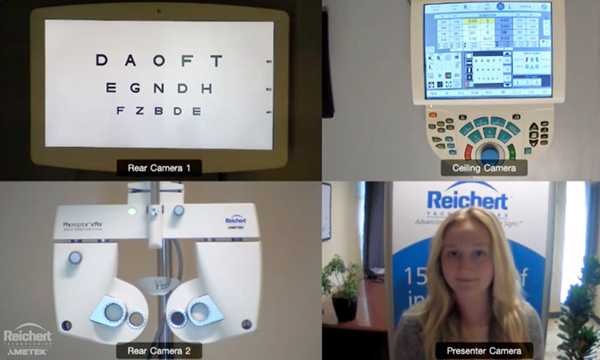 The Virtual Live Demo allows a Reichert specialist to conduct a Phoroptor VRx Digital Refraction System demonstration via a live, one-on-one video conferencing feed. Explore the benefits of having a Phoroptor VRx Digital Refraction System from the comfort of your home or office at a time that fits your schedule. With the Phoroptor VRx Virtual Live Demo, we are able to demonstrate all the system components, including the Phoroptor VRx head, Phoroptor VRx controller, and the ClearChart® 4 Digital Acuity System. Phoroptor VRx sets new standards in digital refraction. With the thinnest, most compact design available, incredibly fast lens exchanges, motorized prisms, split cylinder lenses, and ultra-quiet operation, Phoroptor VRx offers an outstanding user and patient experience. Phoroptor VRx also wirelessly connects to EMR systems as well as numerous models of pre-test and acuity devices from both Reichert and other manufacturers, for effortless integration.